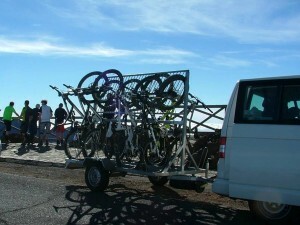 We offer taxi services for mountain bikers to the routes and trails of La Palma (Canary Islands). With our trailers you won’t need to disassemble your bike. La Palma is a paradise for biking. There are several tracks and unpaved trails throughout the island, with its slopes and beautiful sceneries. The constant climate let you ride between the Canary pinewoods, the laurel forests, the volcanoes… at any time of the year. Taxi services with 16-bike trailer. From and to the airport, your hotel, apartment, etc. Special MTB services. Seize the day to do various routes and descents, with the convenience of having all the taxi services you need during the day trip. If you want transportation to bike routes please notice us in the “Any other relevant details” box in our booking form. We offer taxi services from La Palma & Teneguia Princess Hotel (or any other place in Fuencaliente) and the Airport. The duration and itinerary of the tours vary depending on the starting point. We encourage you to read some reviews of our clients about our private tours at TripAdvisor.